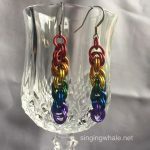 Sometimes you see something that someone else has made and think, “now THAT’S cool.” This is how the inspiration for my newest array of stained glass projects came about. One of the cool things about arts and crafts tends to be about re-purposing, and this new use of old stirrups is one of my favorites so far. I thought about what patterns I would want to do, using stirrups as a base and frame, and off I went. I live in New England, and horses are quite commonplace here. So the obvious choices were to make glass pieces related to horses to use in the stirrups. I found some photos I had of horses and boots, played around in Photoshop to create the line drawings and patterns. Just for fun, I also created a form for a suncatcher to hang in a stirrup, which can wind up being just about any theme. It wasn’t long before a series of pieces came to be. I had already started the process of locating some stirrups which could be used as the frames/bases. With a few then in hand, it came down to just cleaning them up and making the glass. The glass pieces are attached securely to the stirrups using cord. The stirrups themselves are of variable size depending on what I can find and when, though the glass pieces are consistently sized. Some have the rubber pads, and some don’t. I am happy to take orders, but time for fulfillment depends simply on availability of the used stirrups. Know some place looking to get rid of English iron stirrups in New England? Let me know. The horse heads and boots will also be made available as stand alone ornaments, new photos of those to come separately. Horses will be $15, and boots $10, sold as singles rather than a joined pair. I am happy to do them in whatever colors you would like. 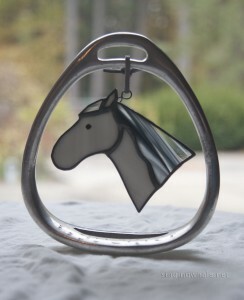 For the stirrups – pieces with just a horse head or just a horse shoe are $35 each plus shipping. Stirrups with a horse head in a horse shoe, small panel, or pair of boots are $45 each plus shipping. Check out the gallery of the first pieces made!